Nicky is a qualified Holistic Lifestyle Coach & Personal Trainer and has specialised in Pre and Post natal fitness for over 10 years. As a Mum to a young toddler, she knows how to balance the intricacies of family, work and staying in shape. Nicky is passionate about supporting other women and Mums in their own journey of staying fit, healthy and balanced, before and after children. Nicky’s approach to fitness training is one of flexibility and individual attention. Each session should reflect what is best for that client on a particular day – some days it feels good to train harder and others, not so much :-). This is part of the holistic approach. Individual attention is reflected in how Nicky modifies each exercise or workout for a person where it is needed. 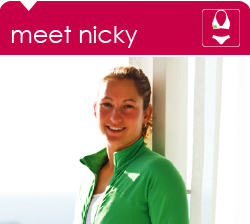 Nicky hopes to inspire her clients with a varied and fun training style. In her eyes fitness should be as enjoyable as it is effective.